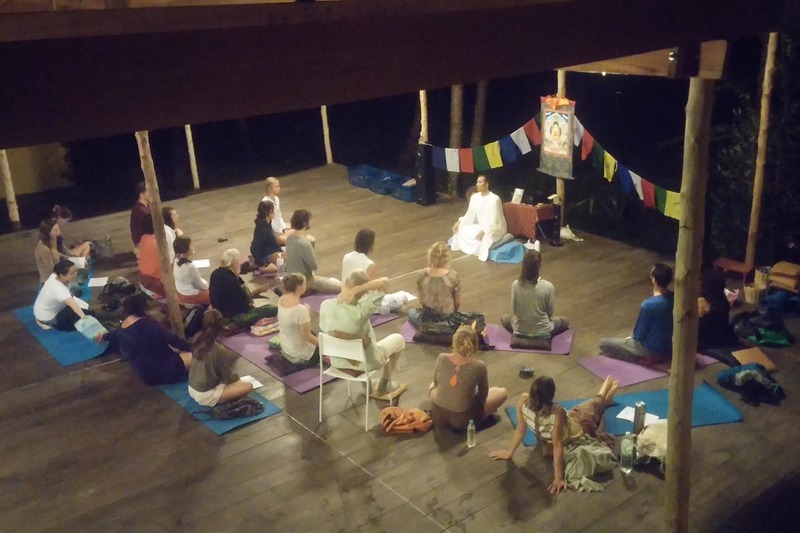 Lobsang will speak, sing and share words and wisdom about Tibetan Buddhism at Love Temple on Arambol Beach (Goa). 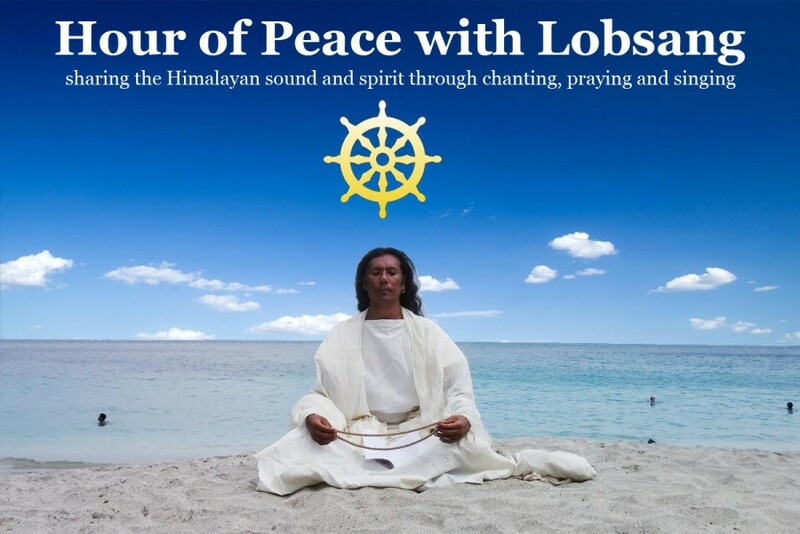 Come and experience Himalayan sound and spirit through his programme — Peace and Happiness with Lobsang. The session will end with group singing of the Medicine Buddha and Tara mantras, and finally with a short meditation. Donations are welcome. I am not a guru -- simply want to share what I have learned. I feel the teachings are helpful in bringing peace and happiness to all beings. Lobsang spoke, sang and shared words and wisdom about Tibetan Buddhism one more time in Koh Phangan before he left for Arambol (Goa). The session ended with group singing of the Medicine Buddha and Tara mantras, and finally with a short meditation. Samma Karuna, Sri Thanu, Wednesday, 6 January, from 7:00pm. Peace and Happiness with Lobsang through his Himalayan sound and spirit. Lobsang shared words, songs, and ideas about Tibetan Buddhism. The session ended with group singing of the Medicine Buddha and Tara mantras, and finally with a short meditation. Samma Karuna, Sri Thanu, Wednesday, 30 December, from 7:00pm. The first hour of second Southeast Asia tour. Chanting, praying, and singing, from 7.30pm to 8.30pm on Wednesday 23 December at Samma Karuna, Sri Thanu. Suprised to have many people despite the heavy rain! 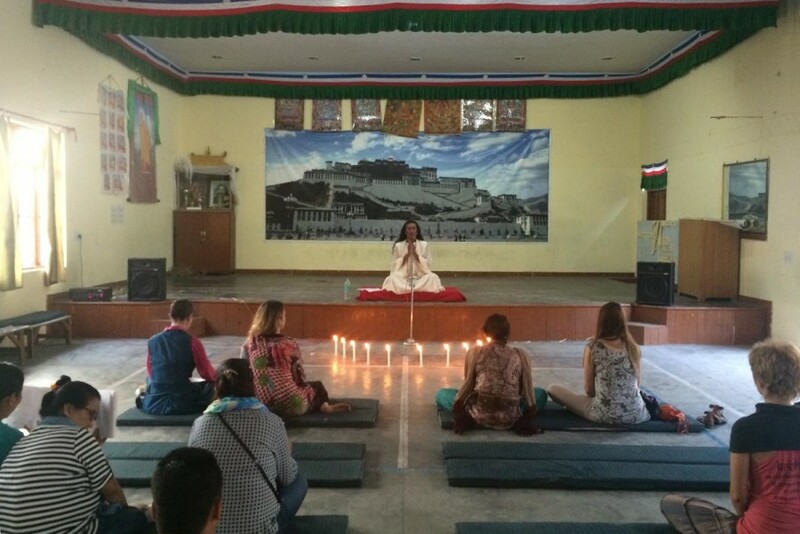 Lobsang Wangyal and Hour of Peace on 23 December 2015 at Samma Karuna, Koh Phangan, Thailand. The final hour of this tour. Chanting, praying, and singing, from 7pm to 8pm on Friday, 21 August, at Samma Karuna, Sri Thanu. We had 10 people, on a busy Friday night at Koh Phangan, with some big events going on here. Again we went a little later with some extra talks. An hour of chanting, praying, and singing, from 7pm to 8pm at Samma Karuna, Sri Thanu, Koh Phangan, Thailand. Again, more than 20 people came and participated, and the programme ended up going until almost 9pm, as everyone stayed for extra talks. 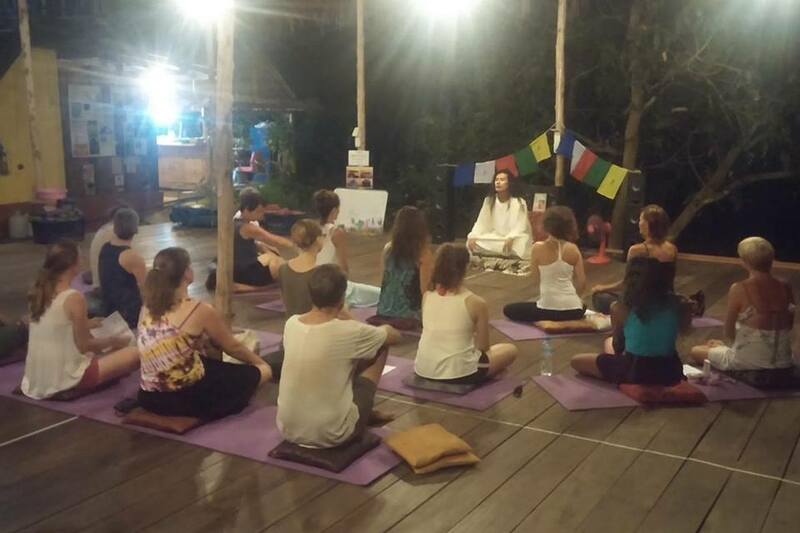 Lobsang Wangyal talking with attendees at Hour of Peace on 17 August 2015 at Samma Karuna, Koh Phangan, Thailand. An hour of chanting, praying, and singing, from 7pm to 8pm at Samma Karuna, Sri Thanu, Koh Phangan, Thailand. Over 20 people listened and chanted in this Hour of Peace. An hour of chanting, praying, and singing, from 6pm to 7pm on Friday 12 June, at Lobsang's Studio (behind Lungta Restaurant), Jogiwara Road. An hour of chanting, praying, and singing, from 6pm to 7pm on Friday 22 May, at Lobsang's Studio (behind Lungta Restaurant), Jogiwara Road. An hour of chanting, praying, and singing, from 6pm to 7pm on Friday, 15 May, at Lobsang's Studio (behind Lungta Restaurant), Jogiwara Road. More than 20 people came to the Hour of Peace for Nepal last night, and we raised 3,700 rupees. So the book looks like this: rupees 500 for the venue; rupees 300 for taxi and coolie (for bringing the sound system); rupees 100 for candles. Net in hand 2,800. I will match that amount. So I will be sending rupees 6,000 next week to a journalist friend of mine in Kathmandu, who I trust to make good use of it. Maybe Tsetan could help me get the money to him. Thanks all for the support and love. Photo by Thupten Tenzin. Nepal earthquake benefit performance by Lobsang Wangyal in McLeod Ganj, India, on 8 May 2015. It is with heavy yet hopeful heart that I will be chanting, praying and singing tomorrow (Friday) for Nepal in my next 'Hour of Peace with Lobsang'. Entry will be by donation, and all proceeds will go for helping Nepal. A journalist friend of mine in Kathmandu wrote to me: "We are completely devastated and destroyed. Many of my kin are lost. Material damaged is unimaginable." So I will send all the proceeds to him. Those who are not in McLeod, but would like to make a contribution could contact me. So, please join me at TCV Day School, Dolma Chowk, McLeod Ganj, from 6:00 to 7:00pm on 8 May (Friday). And please spread the word. Thank you. I am fortunate to have attended many teachings and empowerments given by His Holiness the Dalai Lama. He begins with simple ideas such as, if you can’t help others, at least don’t harm them. He says it’s not important to be Buddhist, but exhorts people to become good human beings. And to those who are Buddhists, he tells them to become 21st century Buddhists — not by faith, but by knowing. When he explains complex ideas such as gross and subtle levels of selflessness, then I get totally lost! From the many teachings that I attended, I was inspired to create this programme, One hour of peace with Lobsang — an hour of chanting, praying, and singing. I am in no way trying to propagate Buddhism, but simply to share what I have learned so far. I feel the teachings are helpful in bringing peace and happiness to all beings. Buddhism, in essence, is not a religion. I find it to be mind science. So it would be helpful to try to understand what it is all about. You could start with the question: Where is I?